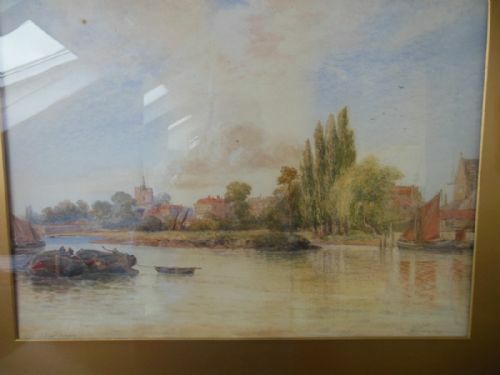 On the left, a view from the Middlesex bank of the Thames looking towards the brewery at Mortlake and down river to Barnes and on the right, a view from the Surrey bank towards St Nicholas's church and Chiswick Mall. 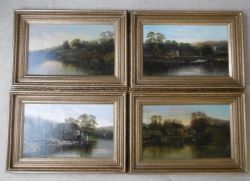 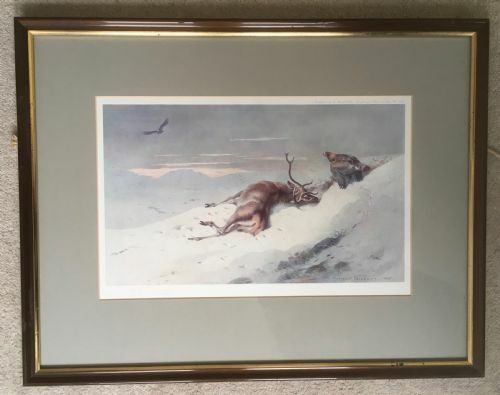 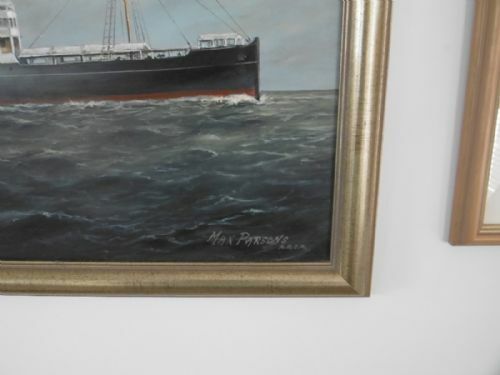 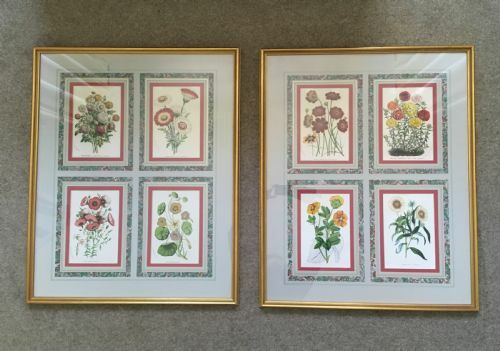 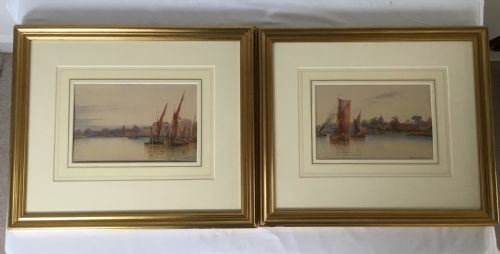 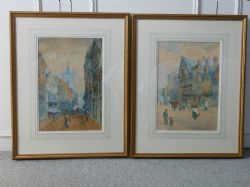 Signed by Gordon A Meadows (1866-1937) this pair are in good condition and ready to hang. 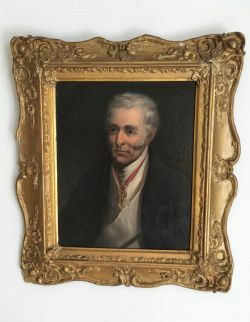 A contemporary oil painting of Arthur Wellesley, 1st Duke of Wellington (1769-1852) in civilian dress wearing the Spanish Order of Knights of the Golden Fleece, probably towards the end of his life in the 1840s. 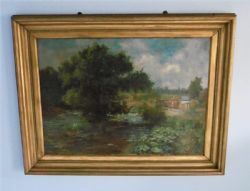 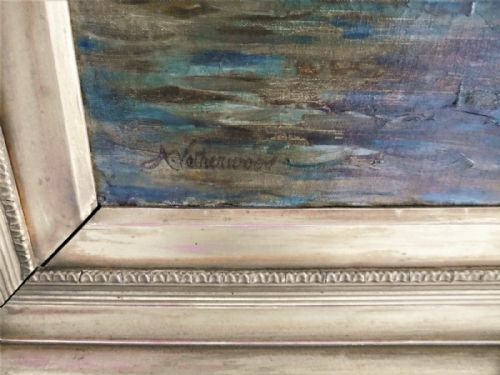 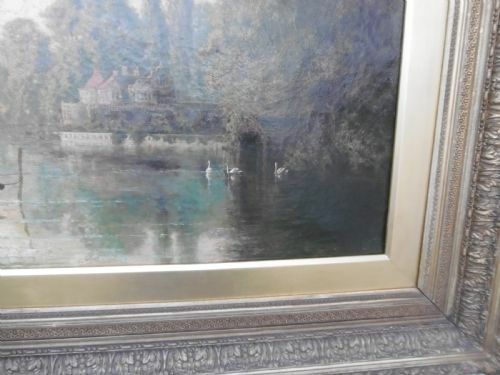 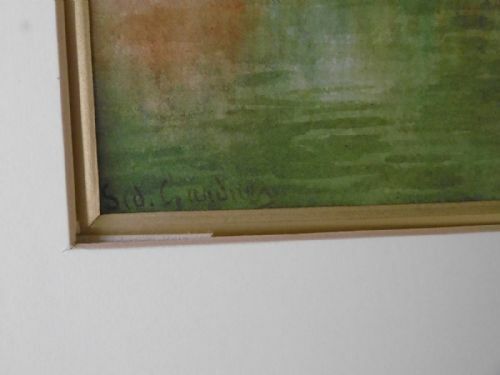 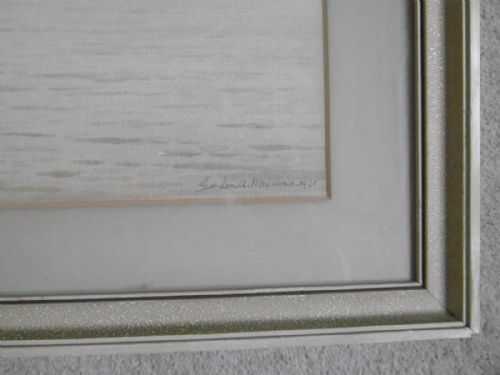 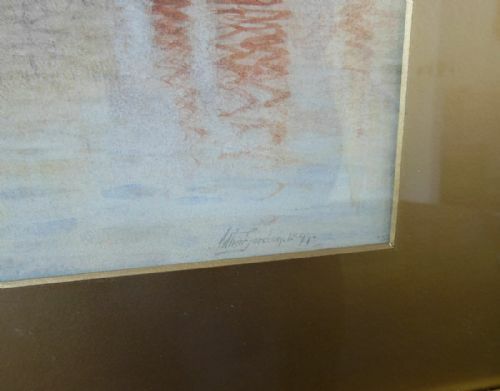 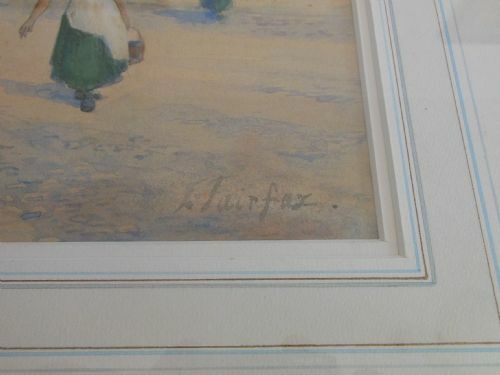 A fine painting in good condition but in a contemporary frame that can best be described as delicate and fragile. 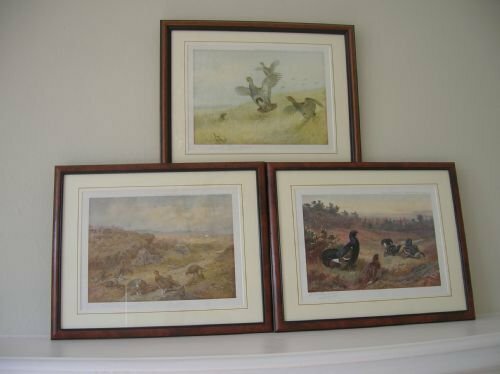 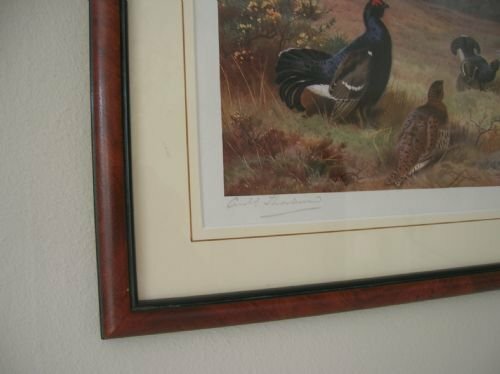 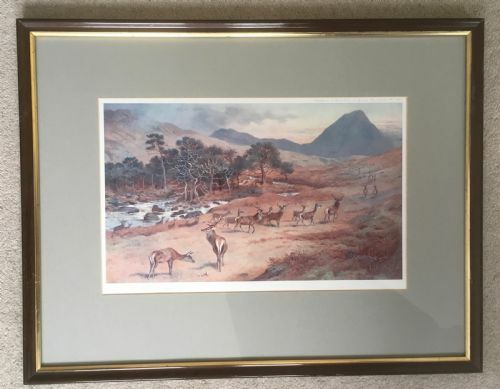 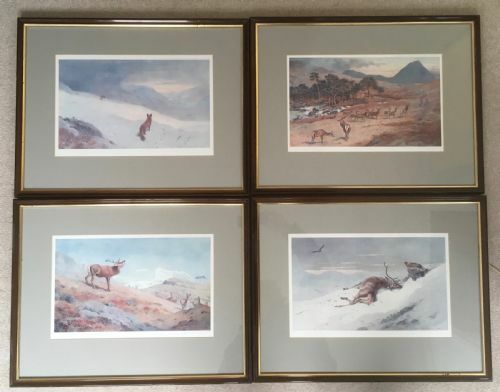 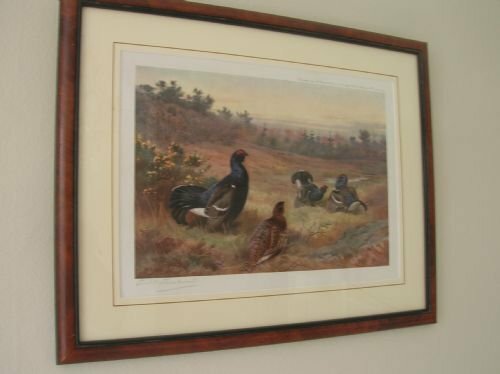 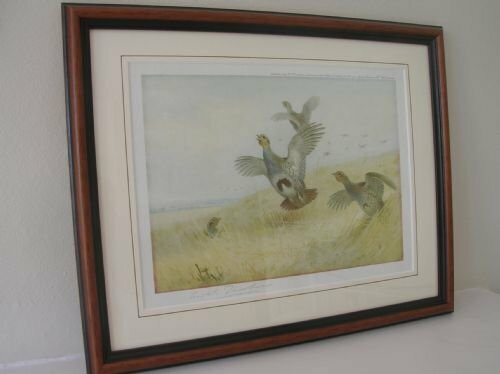 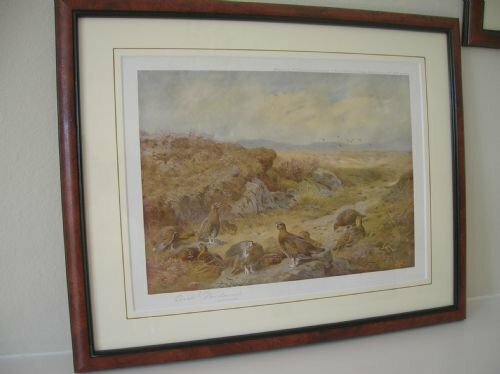 Three framed colour prints of game birds by Archibald Thorburn signed in pencil in the bottom left hand corner. 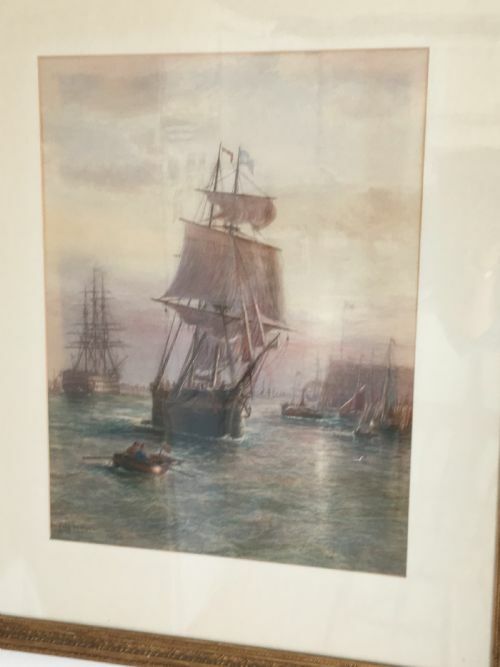 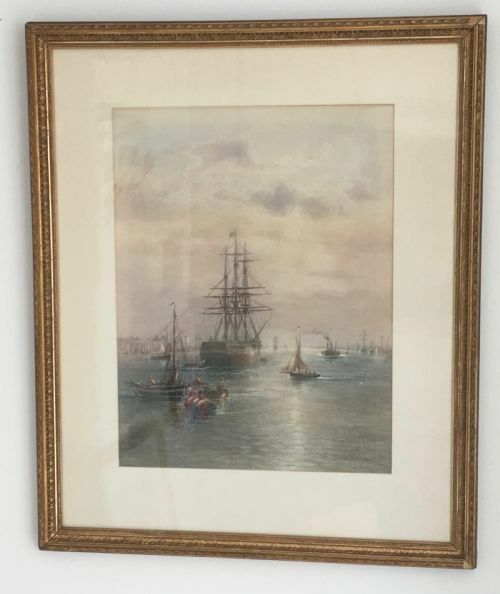 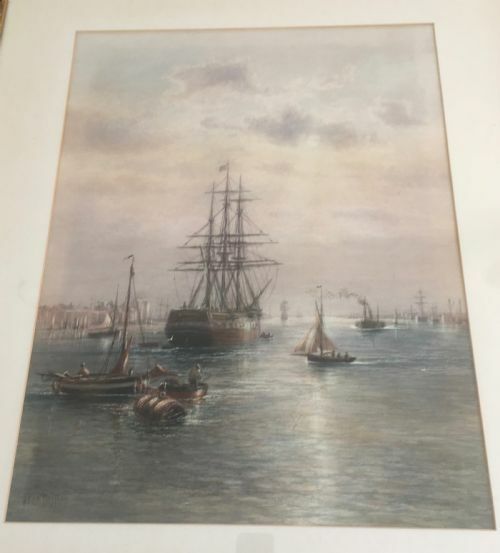 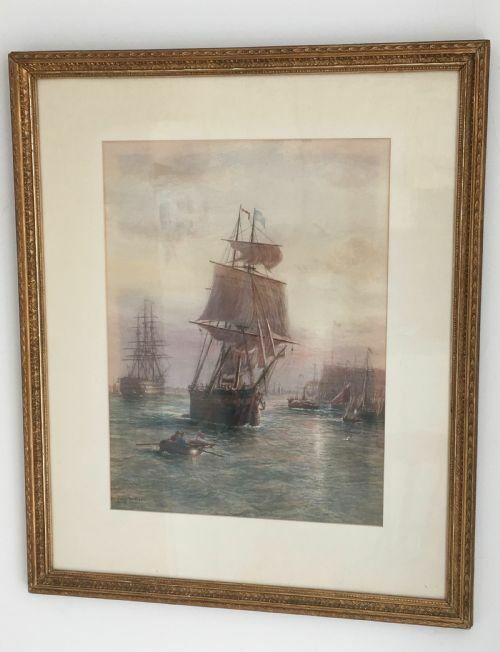 Signed by Fred Miller and dating to the late 19th Century this pair of well executed watercolours shows shipping scenes off Portsmouth. 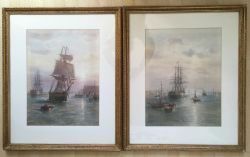 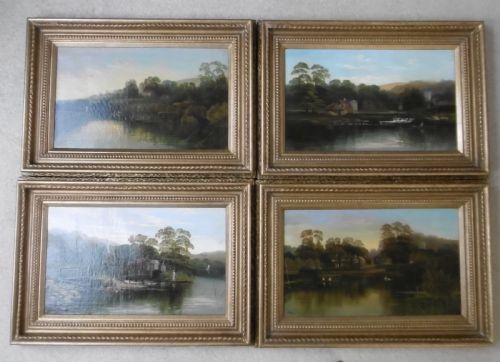 In good condition with contemporary frames they are ready to hang. 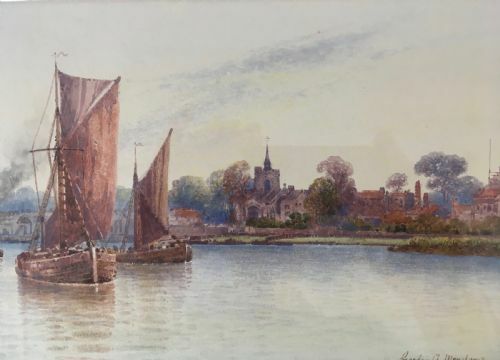 "Brewery Barges at Mortlake" Dated 1921. 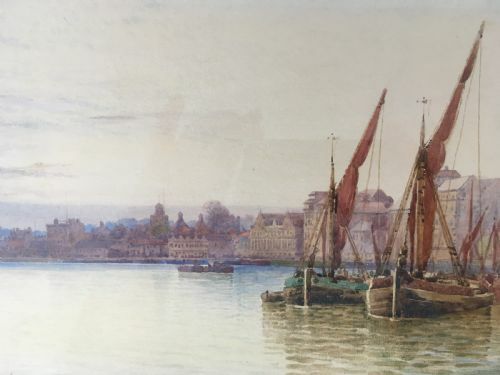 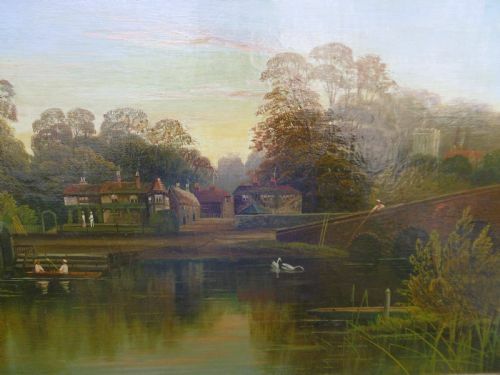 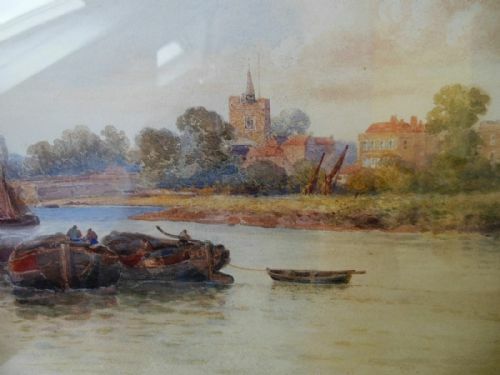 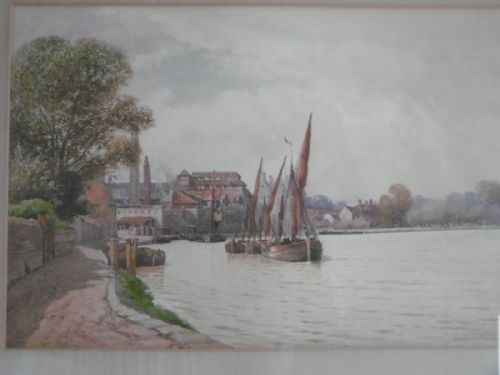 This a watercolour by Gordon A Meadows 1866-1937 (aka Arthur Gordon Meadows) painted from the Surrey bank at Barnes looking west down the river to the brewery at Mortlake. 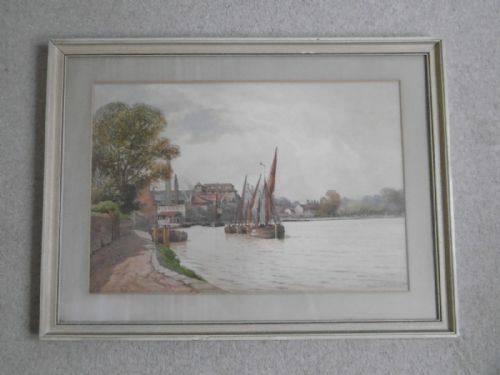 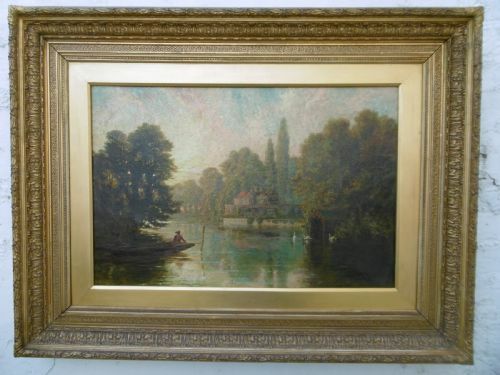 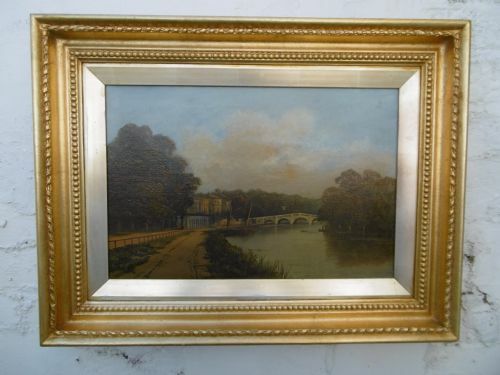 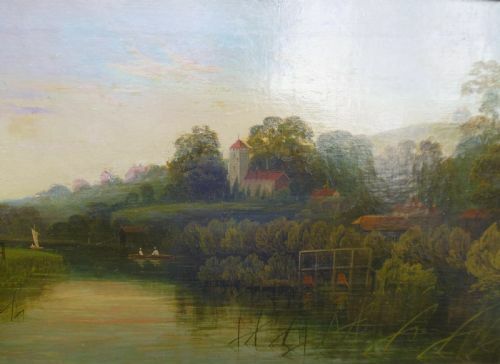 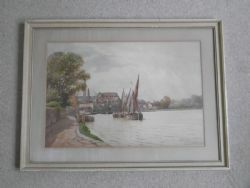 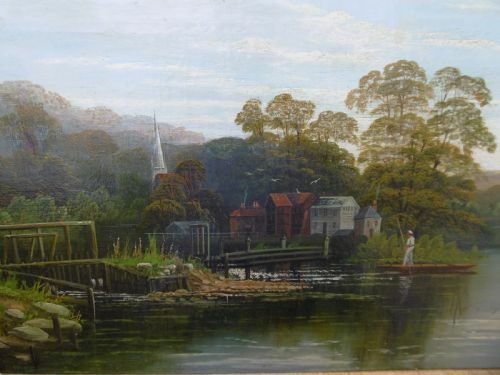 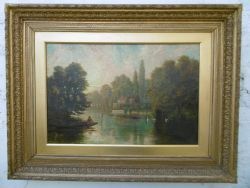 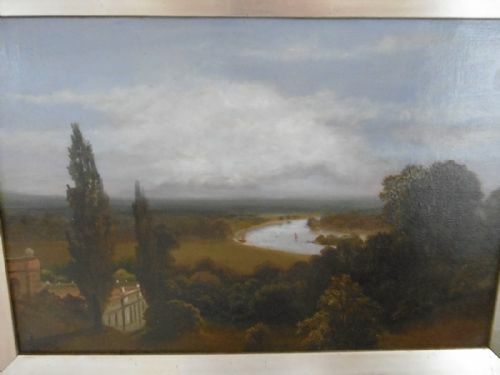 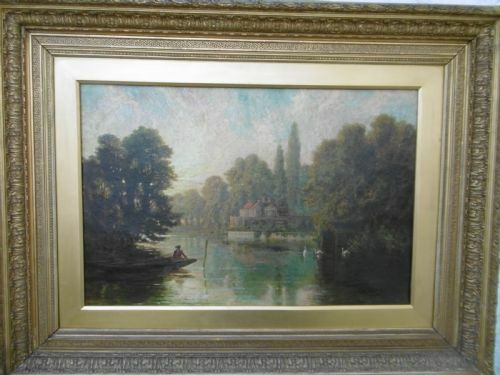 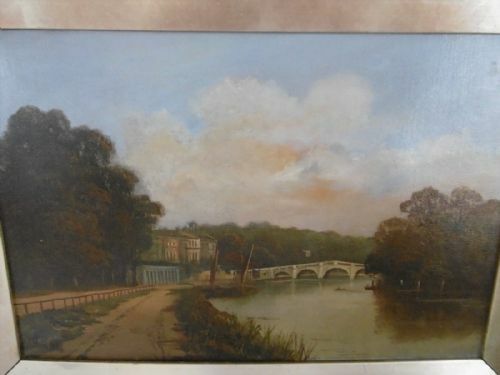 It is in excellent condition however the picture would benefit from re-framing and would make a great pair with another watercolour by this artist that I have entitled "Chiswick on Thames"
A watercolour of the view from the Surrey bank of the Thames at Barnes of the houses on Chiswick Mall and St Nicholas Church with barges and Chiswick Eyot in the foreground. 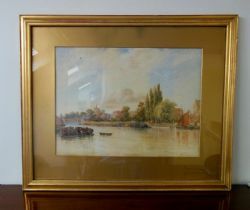 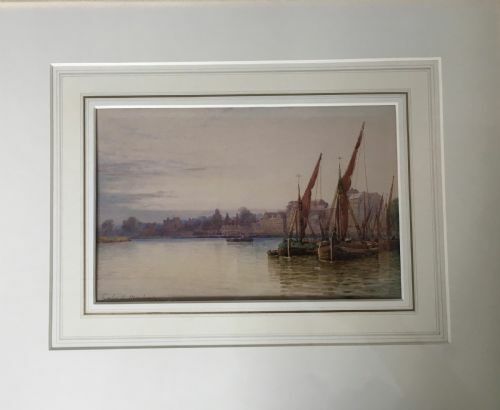 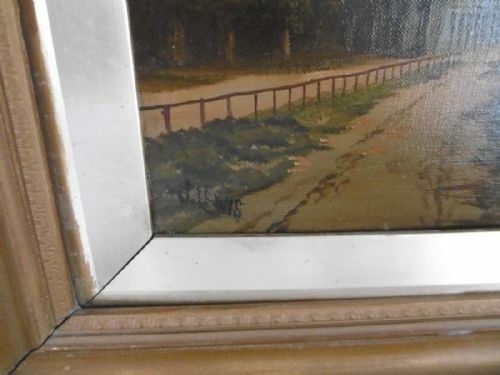 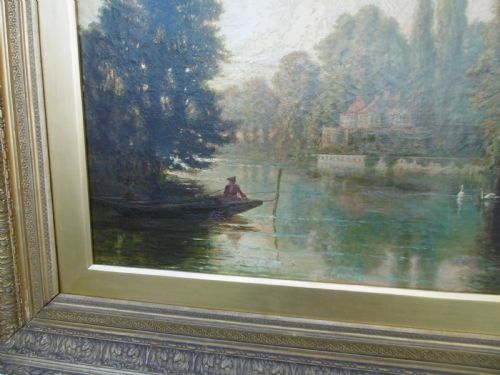 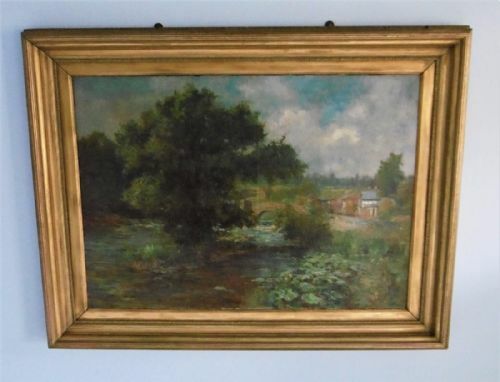 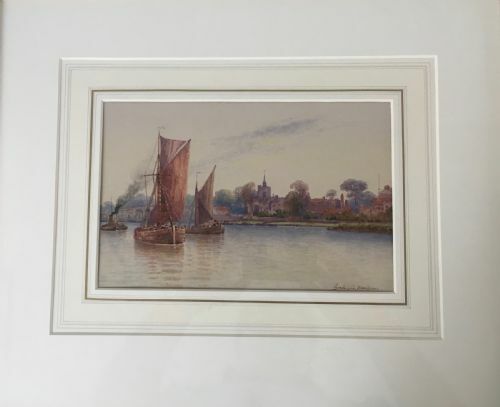 Inscribed and dated by Meadows (1866-1937) in 1897 this is a charming picture of the river at Chiswick in it's original frame and glass, there is a little foxing which could be addressed if desired. 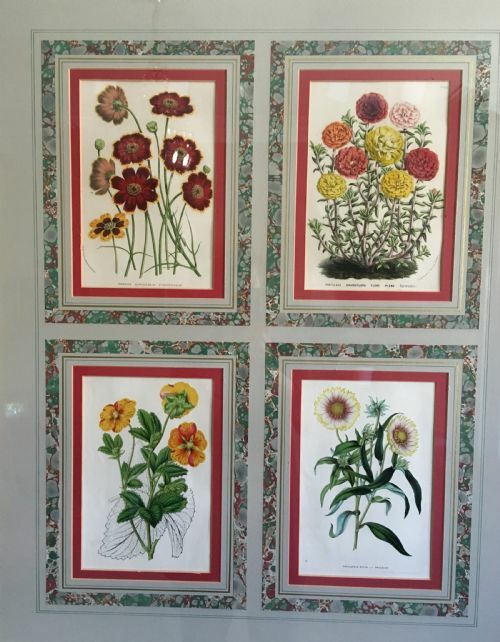 Published c. 1850 by Louis Van Houtte in ‘Flore des serres et des jardins de l’Europe’, these multi-mount botanical lithographs in original colour are highly desirable, superbly decorative and considered very collectable. 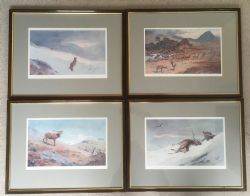 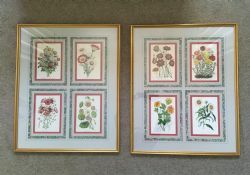 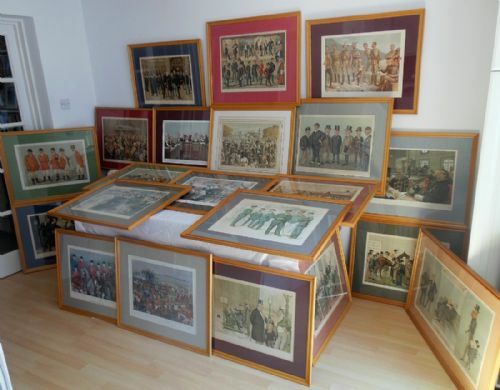 They are in fine condition and attractively mounted and framed. 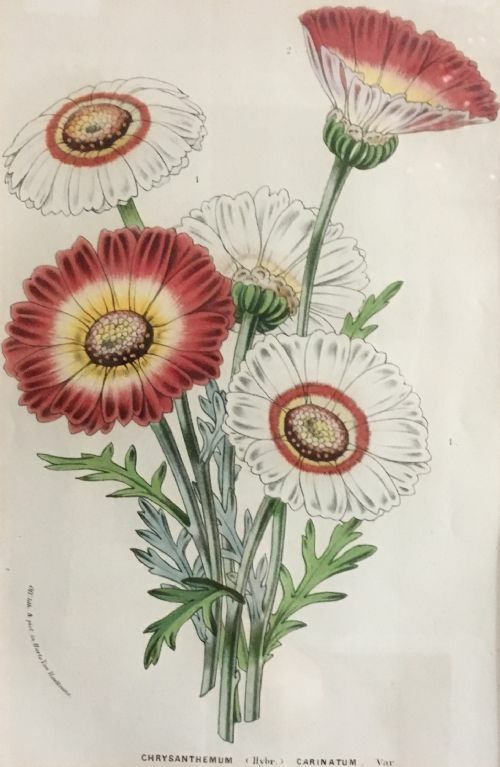 Louis Van Houtte was the founder, publisher and part-editor the " Flore des serres et des jardins de l’Europe". 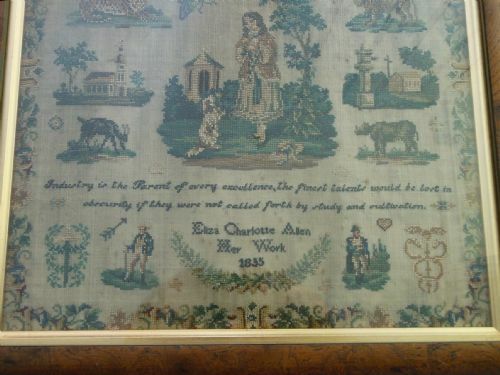 He was also the proprietor of the largest nursery of its time on the continent. 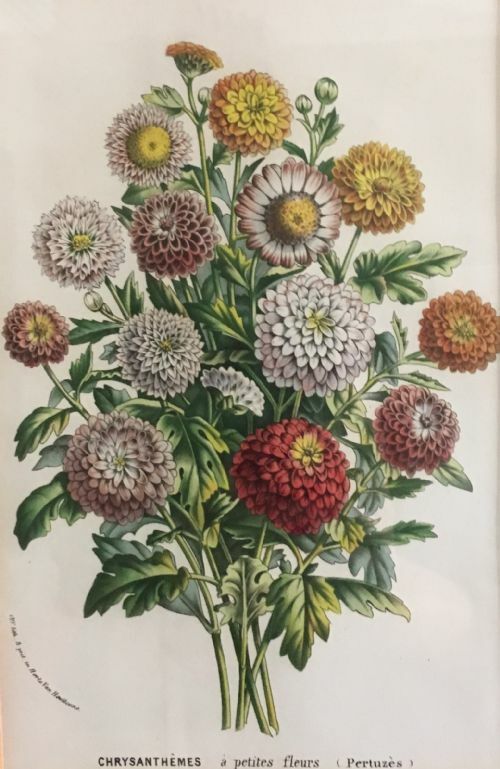 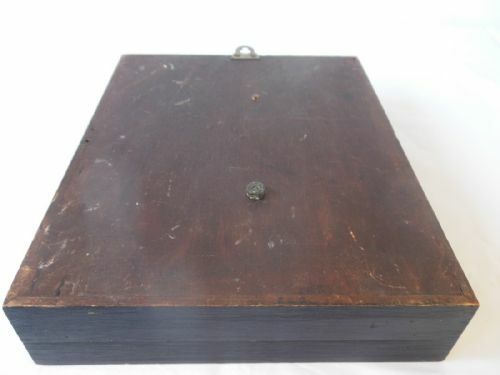 The periodicial appeared monthly for almost 40 years and was published by his own printing office in the middle of his gardens, the Horto van Houtteano. 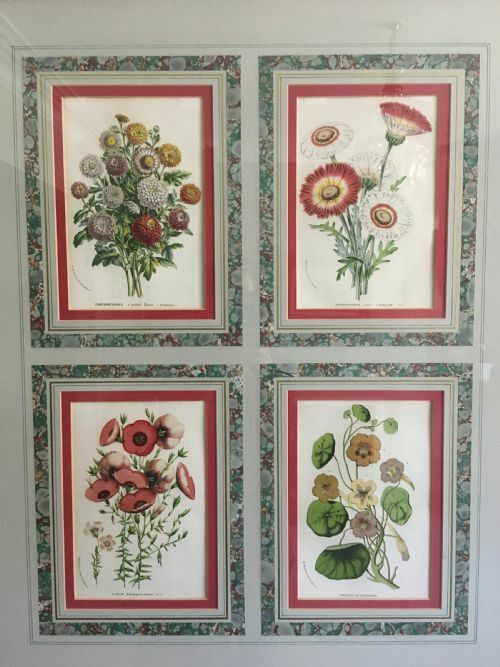 The work is notable for the craftmanship of the Belgian lithographers Severeyns, Stroobant and De Pannemaker, who had mastered the art of colour-printing from stone. 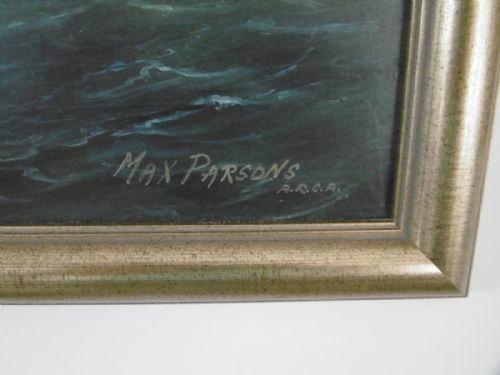 Max Parsons (1915-1998) A.R.C.A. 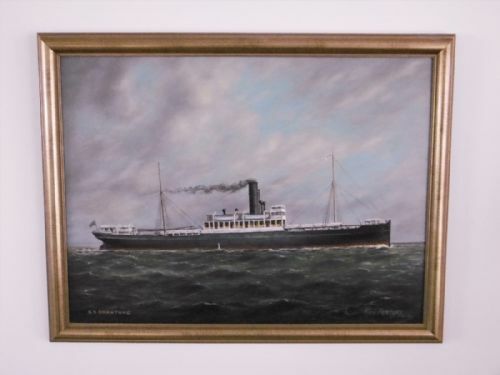 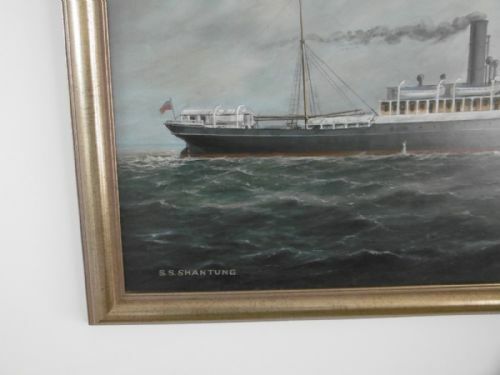 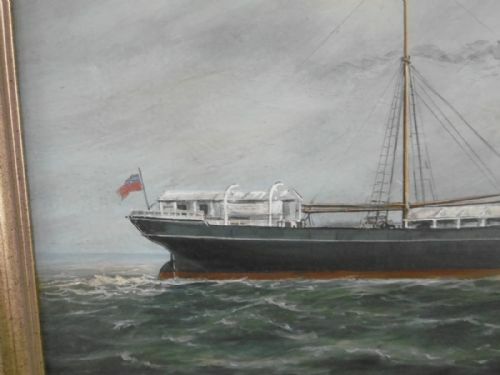 oil on board of SS Shantung, coastal freighter, 2,549 tons, launched in 1915 for The China Navigation Co Ltd (Swire family) in Hong Kong. 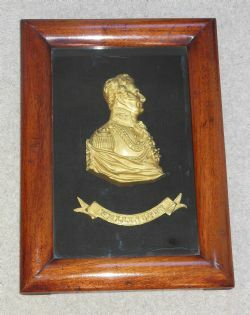 Field Marshal Arthur Wellesley, 1st Duke of Wellington. 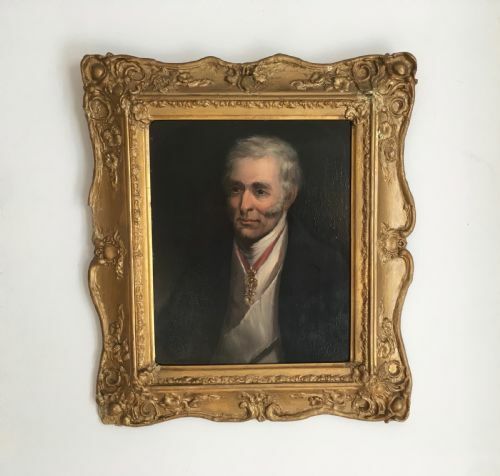 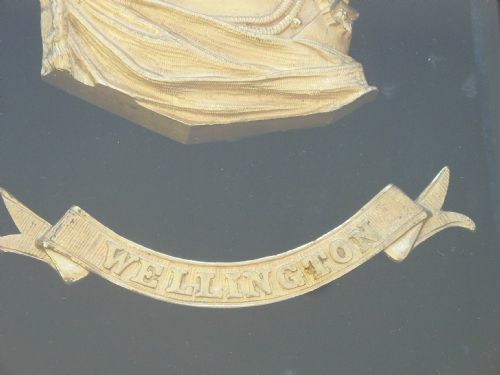 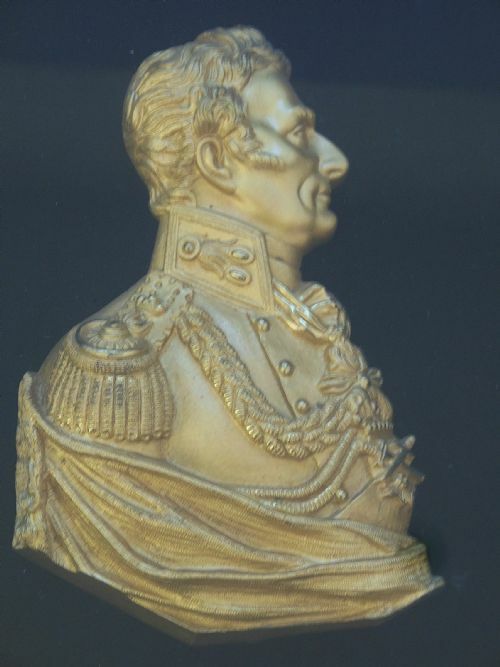 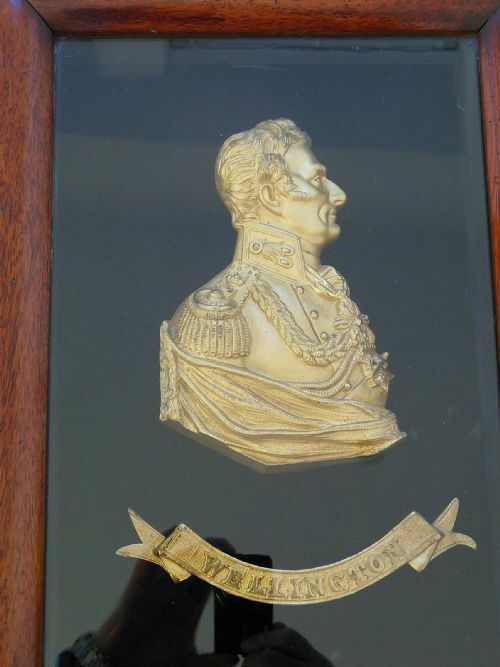 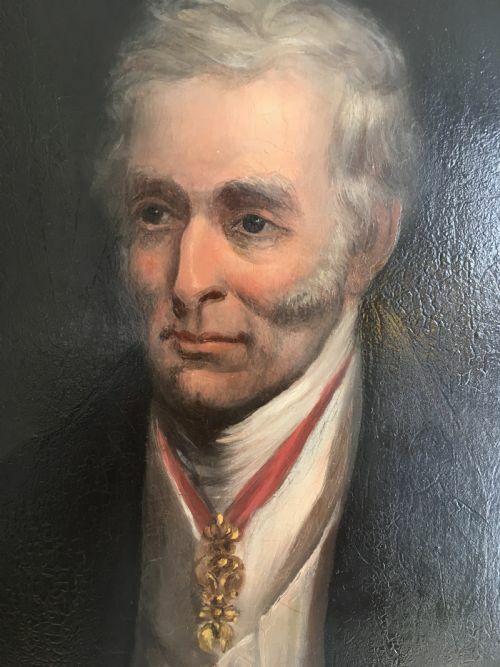 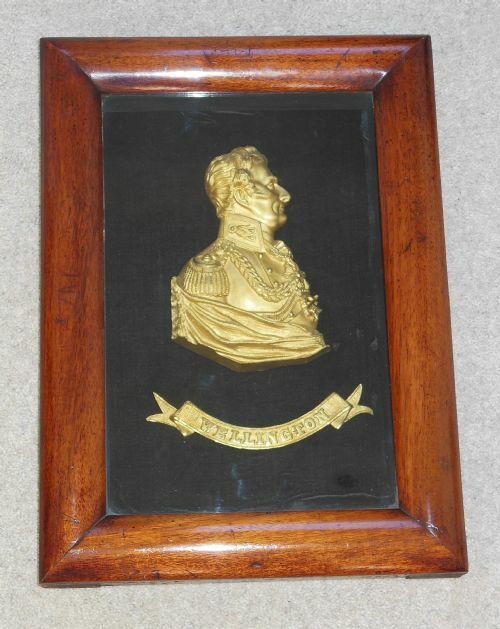 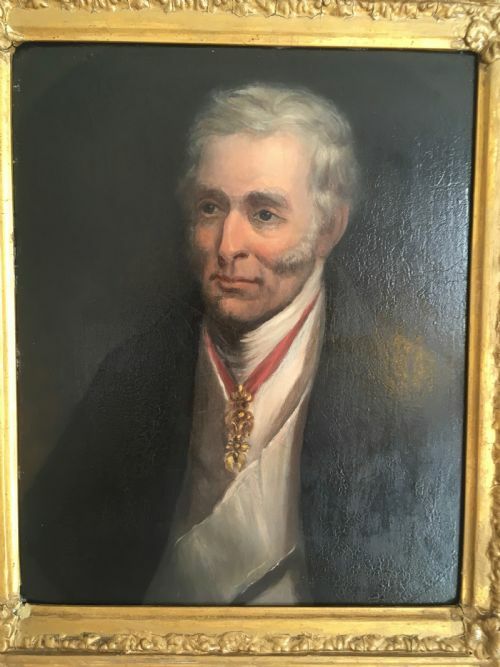 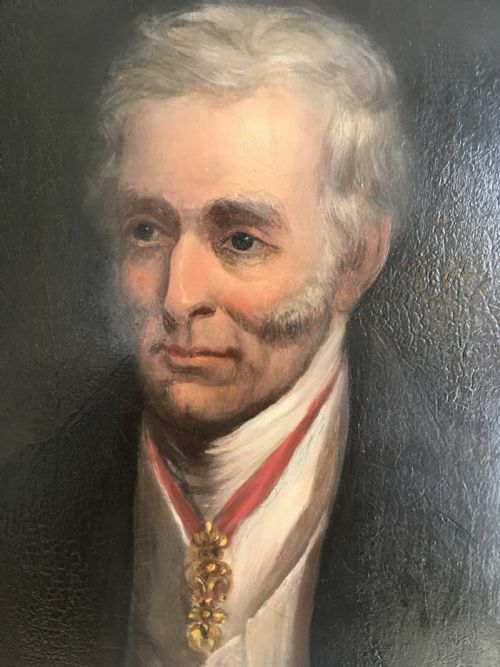 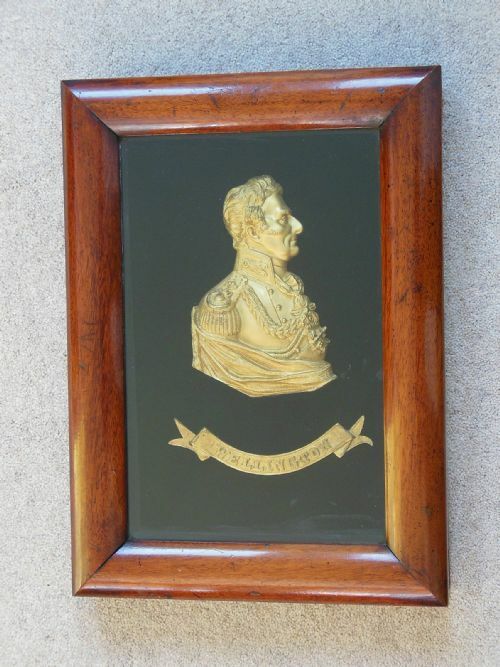 This is an oak framed mid Victorian gilt relief portrait of the renowned soldier and statesman, hero of the Peninsular Wars and commander of the allied forces that defeated Napoleon at the Battle of Waterloo in June 1815. 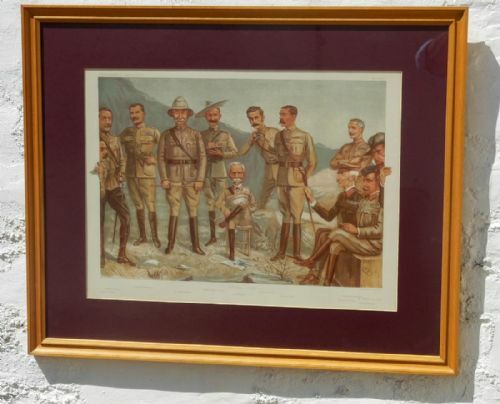 This portrait is in excellent condition as it celebrates the the double century since that famous victory. 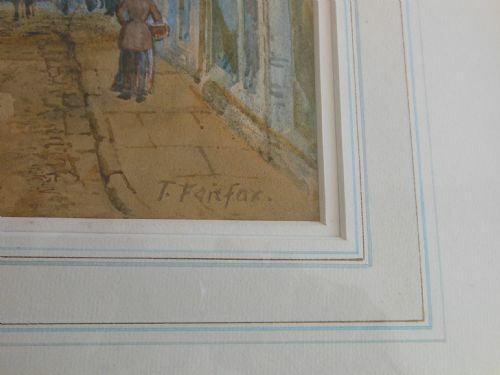 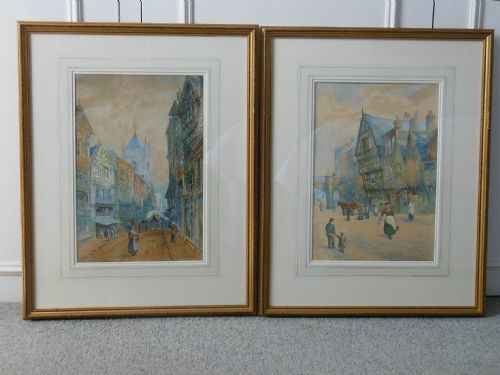 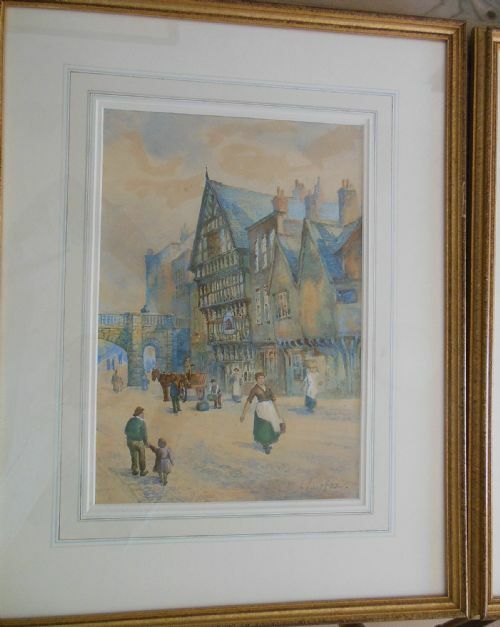 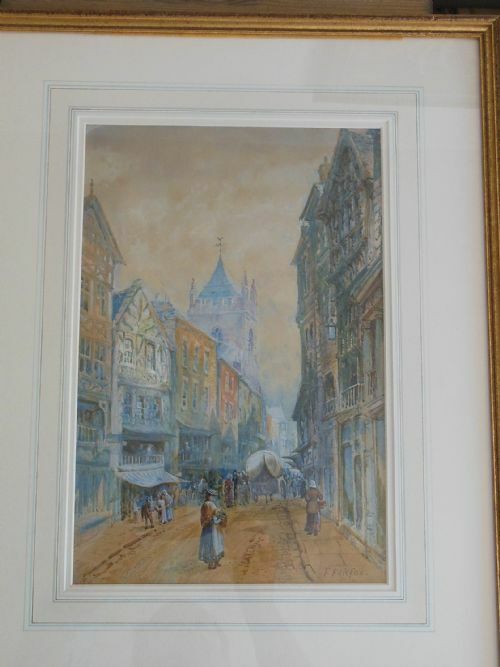 Painted at the end of the 19th Century, this pair of watercolours by T Fairfax, are views of Bridge Street, St Peter's Church and the Bear & Billet Public House in Chester, framed and mounted they are ready to hang. 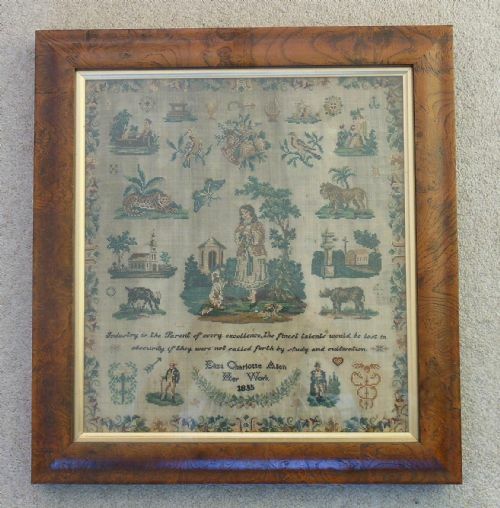 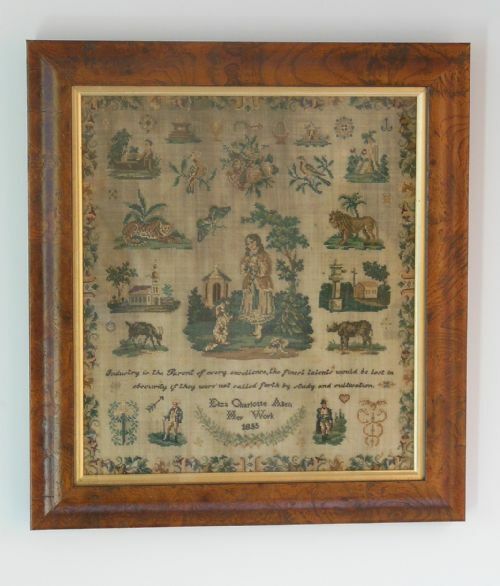 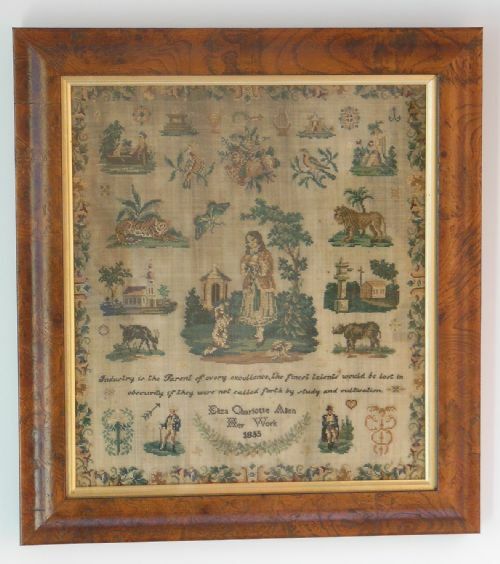 Victorian Sampler "Eliza Charlotte Allen"
Dated to 1855, this sampler is in very good condition and features fine needlework of birds, trees, plants, wild animals, churches, Victorian men in uniform and in the centre a young girl with her King Charles spaniel. 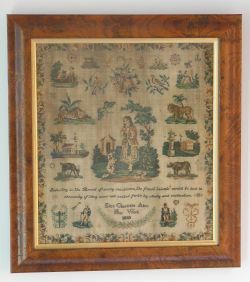 The general feeling of the sampler leads to a belief that it was created by a young girl living in the colonies, possibly sub saharan Africa. 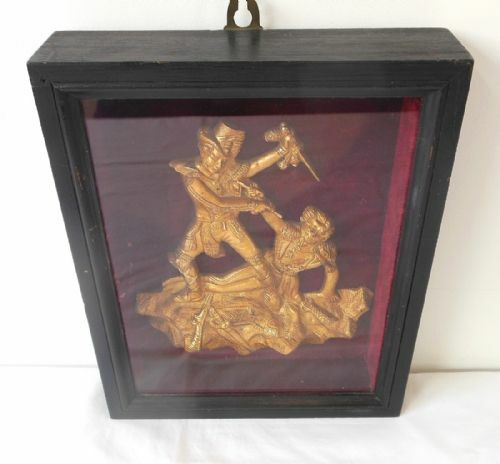 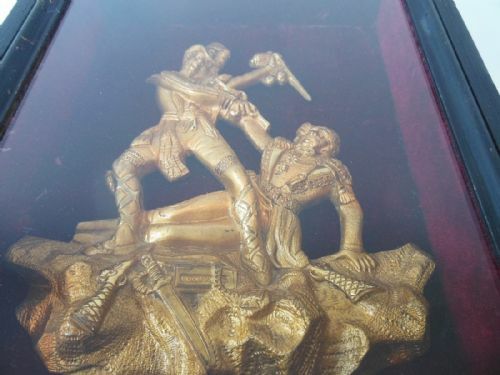 This appears to be two Regency era men fighting with pistols and knives. 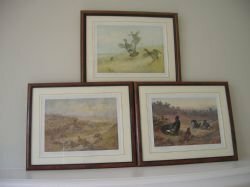 It occurred to me that this tableau may be from a play or known historical event. 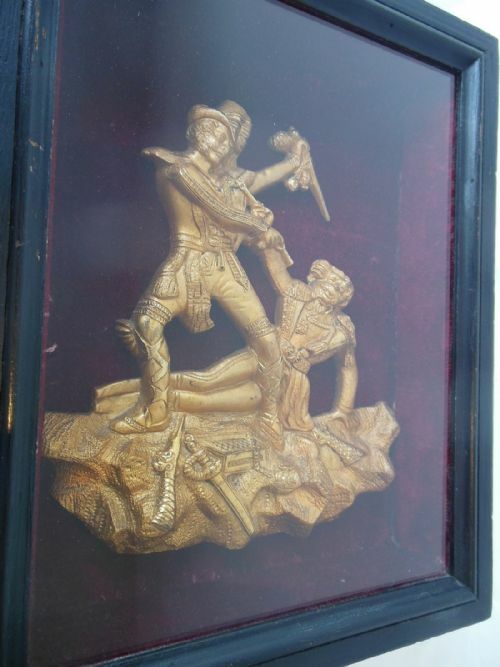 I have spent some considerable time researching it and have uncovered little - so if anyone knows what it represents I would love to be enlightened. 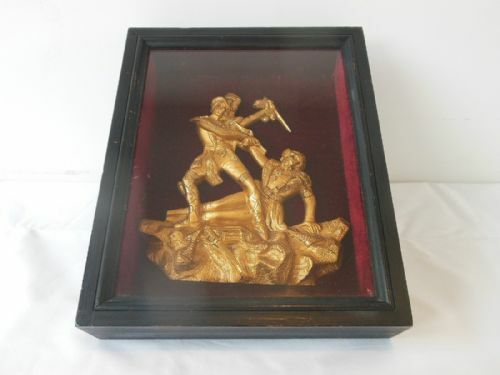 The gilt relief is sitting on a red velvet background inside a hardwood case. 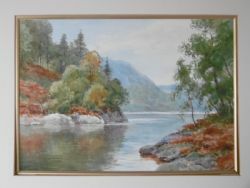 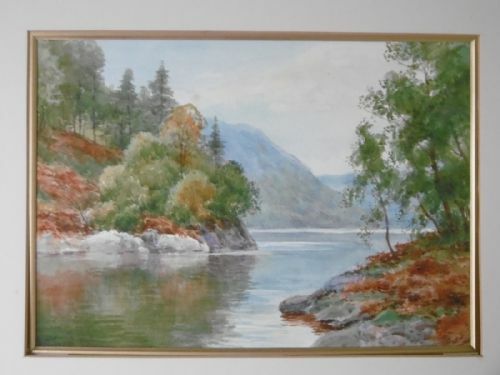 A view of a corner of Loch Katrine in the Trossachs by Sidney Valentine Gardner 1869-1957. 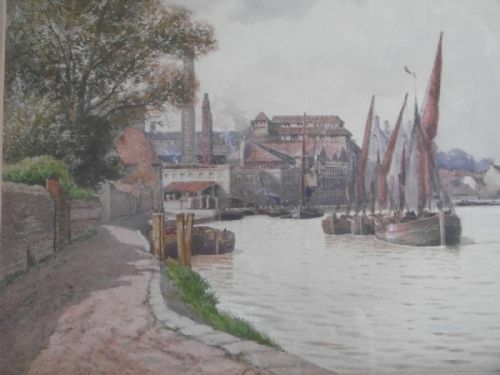 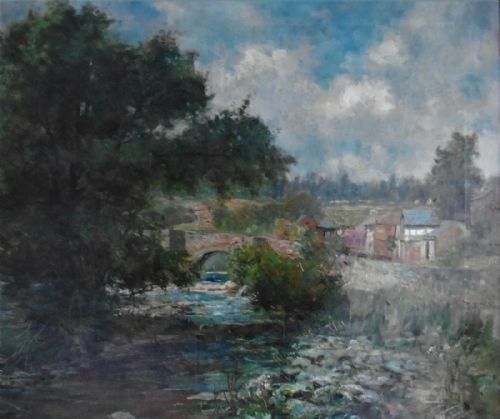 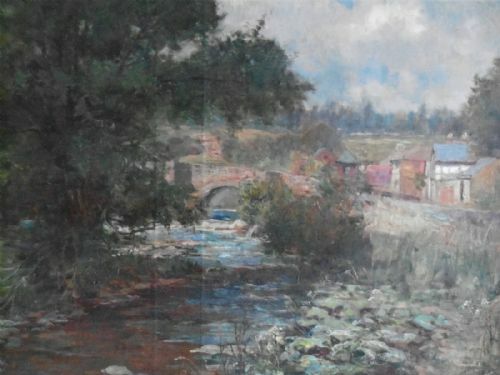 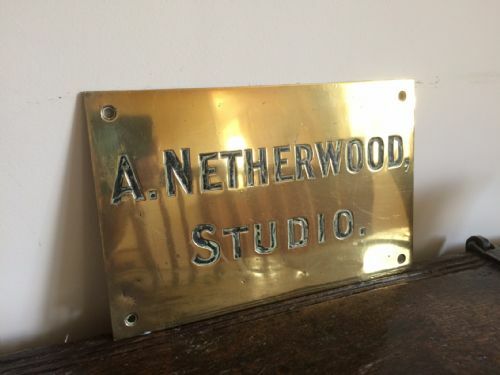 Sidney was a member of the Staithes Art Club 1903 and a long time member of the Nottingham Society of Artists where he exhibited at least 73 times. 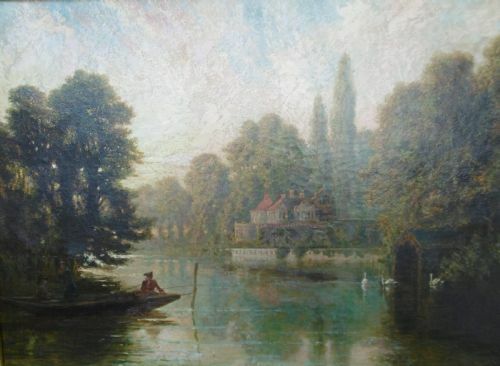 He also exhibited at the Royal Academy and the RSBA. 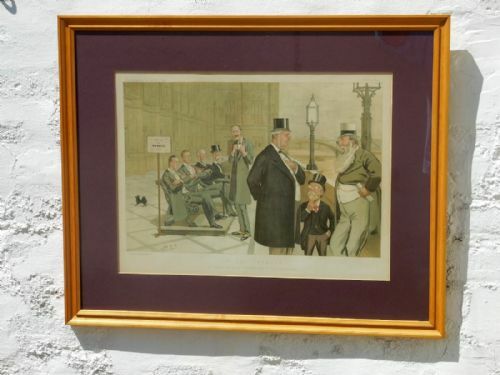 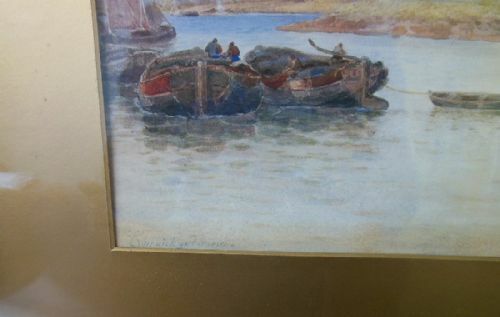 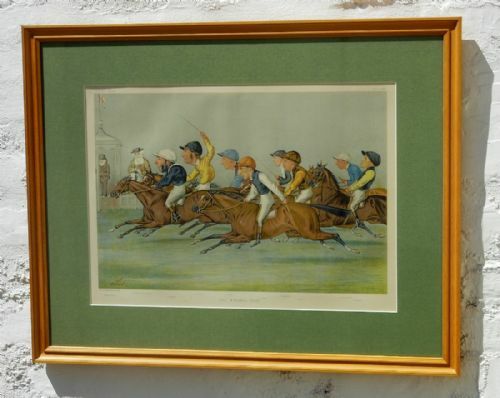 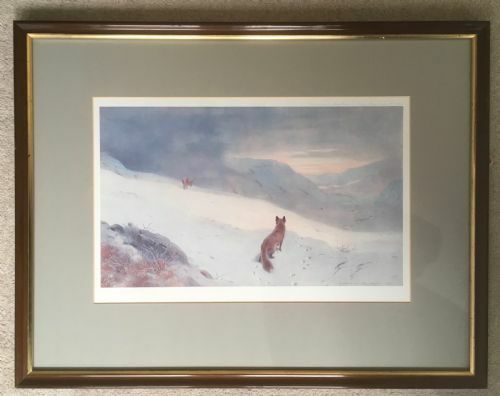 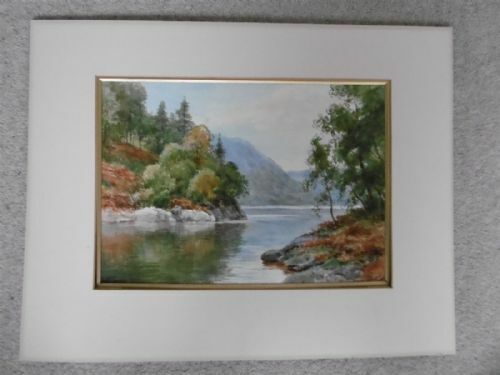 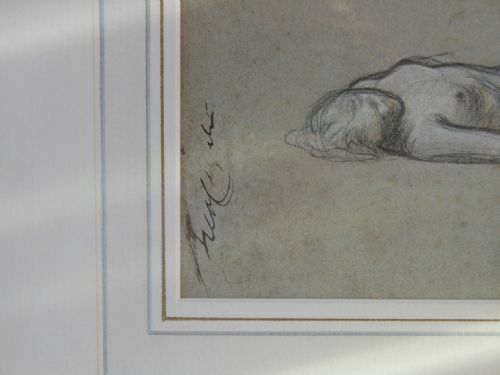 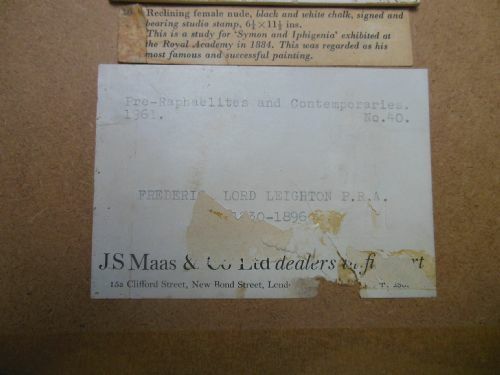 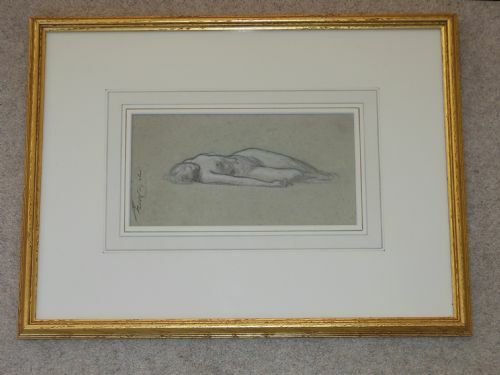 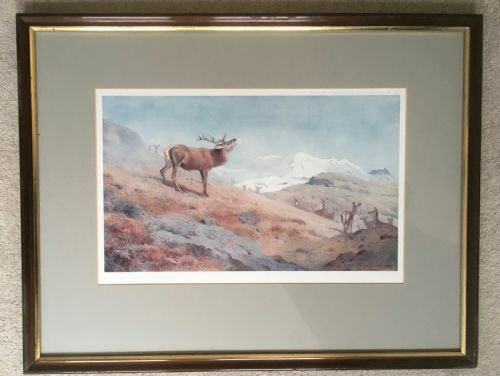 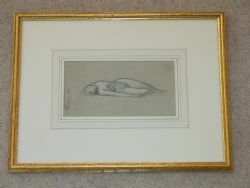 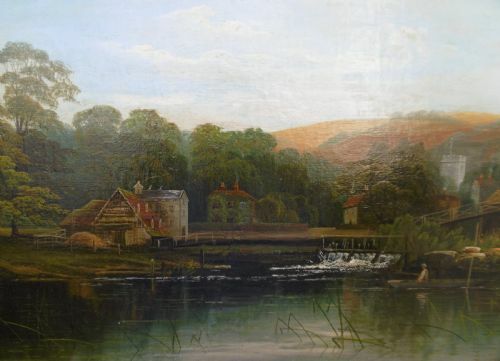 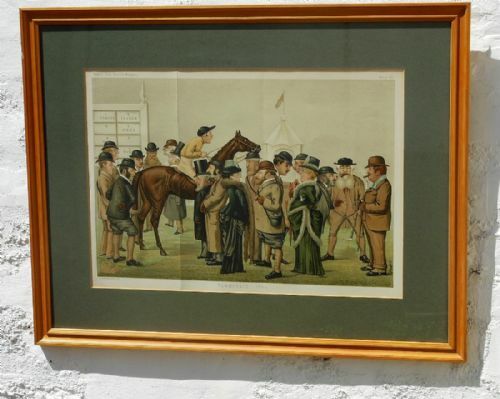 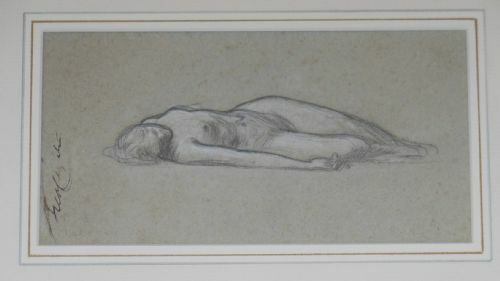 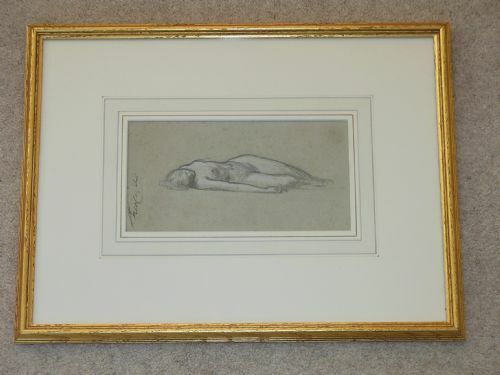 The watercolour is unframed but in a mount and is in excellent condition.